← Are you weirder than Weird Al? 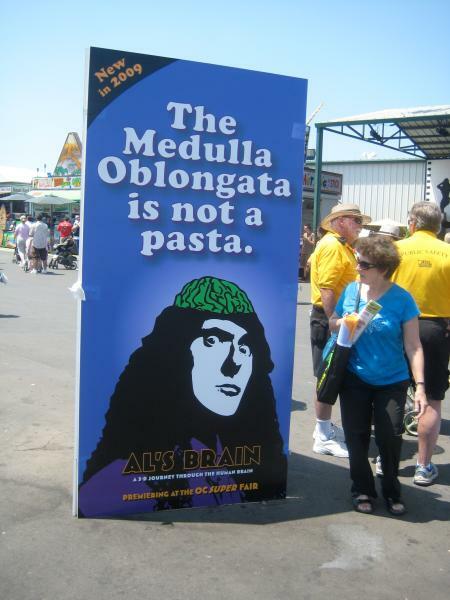 The Medulla Oblongata is not a pasta. New in 2009, Al’s Brain… a 3-D journey through the human brain. Premiering at the OC Super Fair. Sounds like we’ll be taking a fantastic voyage soon to see what’s going on in his head. Woo! Anybody else find any info about this attraction? This is THE greatest news ever! I’m so happy! I always knew his brain was green. I’m surprised he’s participating in such a topic. The subject of the biological basis of behavior was not a strong area for me in college. Very interesting. I look forward to it. It’s all true! Every last morsel of Al goodness…he’s working some major magic for the 2009 OC Fair. And it’s in 3-D, just like the album. Don’t know how much I can say but Al is extremely nice in person and is throwing himself wholeheartedly at this project for the Fair, which may or may not include an exclusive song (but you didn’t hear it from me). Hey! Don’t know how many of you are interested in this topic anymore, but I thought I’d give you an update seeing as how, well, I just saw this wonderful little nugget of Al filled goodness. The OC “super” fair is a clever re-wrapping of what is, in fact, just the plain ol’ Orange County (CA) fair. They added some new buildings to the fairgrounds and decided that made it super. “Al’s Brain” is a wonderful 10 or so minute 3-D adventure featuring several cameos, including Fabio, Paul McCartney and others, some well know, others perhaps only known to frequenters of Cartoon Network’s ADULTswim…and yes, there is a new song, about, you guessed, the brain. From my understanding the exhibit will wrap in OC when the fair does and then pack it’s bags for Puyallum(sp? ), WA. It was great, and if it happens to make it’s way to a town near you, I HIGHLY recommend you make it to wherever it is to see it. Me, my father and my sister all decided it was worth the price of admission alone. Have fun! Cool! Thanks for the info Joey.